We continue with another mod for Minecraft, in this case a fairly simple mod that can be quite useful to find villages. Search for people: The mod looks nearby villages, when are more than 64 blocks away, this line announces “Distant village found” while when we are less than 64 blocks far will announce “Inside village”. Town center: Just will show the center point of the town. Golems: Show the number of golems that exist in that town. If we are near the point where they spawn, golems will see a new line in this section. 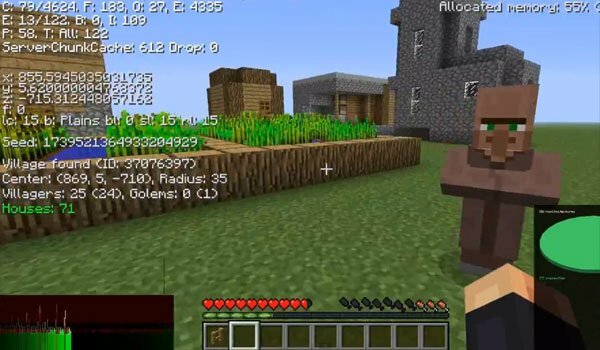 Homes: Appears the number of houses that have the people, when there are more than 21, numbers will be green, indicating that the town can spawn golems. Below 21 houses numbers won’t appear and they will be red. How to install Village Info Mod for Minecraft 1.10.2?